The Mexican gray wolf (Canis lupus baileyi), or “lobo,” is the smallest, southernmost occurring, rarest, and most genetically distinct subspecies of gray wolf in North America. It once occurred in the mountainous regions of the Southwest from central Mexico throughout portions of Texas, New Mexico, and Arizona, and perhaps even farther north, as suggested by more recent research. Aggressive predator control programs towards the turn of the century all but exterminated the Mexican wolf from the wild. With the capture of the last 5 remaining Mexican wolves in the wild in Mexico from 1977 - 1980, a captive-breeding program was initiated and saved the Mexican wolf from extinction. Today, the captive population consists of approximately 300 animals, and encompasses over 45 zoos and wildlife facilities throughout the United States and Mexico. Below, you'll find a collection of links relevant to the wolves in New Mexico. Some pro-wolf, some anti-wolf. Look at both sides and then decide for yourself. Mexicanwolves.org is a collaborative effort of local, regional, and national conservation, scientific and sportsmen’s organizations, and concerned citizens using the Internet to help save the endangered Mexican gray wolf. The New Mexico Wilderness Alliance is a nonprofit 501(c)(3) grassroots organization dedicated to the protection, restoration, and continued enjoyment of New Mexico’s wildlands and Wilderness Areas. 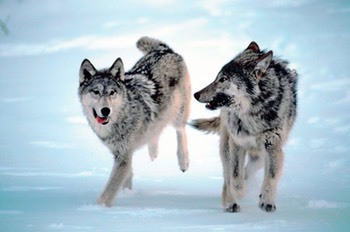 America's wolves were nearly eradicated in the 20th century. Now, after a remarkable recovery in parts of the country, our wolves are once again in serious danger. This is the U.S. Fish and Wildlife website. "Blogging for the Gray Wolf"
HOWL Colorado is a group of concerned, informed Coloradans who are looking to educate Americans about the plight of the wolf, dispel the myths from hundreds of years of misinformation about these elusive apex predators, and are actively participating in protecting the future of American wolves. The smallest gray wolf subspecies in North America, the Mexican gray wolf is also one of the rarest and most endangered mammals on the continent. Located in New Mexico, Wild Earth Guardians is at the forefront of the fight to save the wolf. Their "About" page says: "This is not a pro-hunting blog, nor an anti-hunting blog. There is a good reason. Bad feeling between hunters and those don’t like hunting is probably the single biggest reason why there is not a widespread political movement to protect and enhance wildlife and wildlife habitat in the United States. Part of this split is philosophical, but part is deliberately stirred up by those who have other political and economic agendas." The U.S. Fish and Wildlife Service and its partners have been reintroducing Mexican gray wolves into the wild since 1998. Based on recent reviews, biologists have decided to continue the wolf reintroduction in Arizona and New Mexico. Wolf Crossing | An examination of the Mexican wolf program, other invasive predator reintroductions and how they impact the surrounding human habitat. An anti-wolf website that is hosted on a webserver in Silver City, NM. called "mightyfree.com"
A speech given by Laura Schneberger, the president of the Gila Livestock Growers Association, to the Society of Range Management, New Mexico Section. A website entitled "Life, Liberty, Politics and Policy in the Land of Enchantment". From the Klamath Bucket Brigade. (www.klamathbucketbrigade.org) Their mission statement: "Promote individual and property rights that are vital to the safety, social and economic well-being of the United States." The purposes for which the Association is organized are to advance and protect the cattle industry of New Mexico, work toward solutions of cattle industry problems, promote the well being of the industry, provide an official and united voice on issues of importance to the cattle producers and feeders, and to create and maintain an economic climate that will provide members of the Association the opportunity to obtain optimum return on their investments within the free enterprise system.